The first shiver down the spine happens when you drive down Potash Lane, look right and see the Classic Team Lotus transporter parked up in front of the workshops. The next occurs when you carry on down Potash Lane and see the Group Lotus sign in iconic green and yellow. We signed in at the gate and drove past the old Lancaster Bomber hangers (which form part of the factory) to the old airport control tower which is both a suite for hosting guests, and a brilliant vantage point of the Hethel Test Track. Dotted around these buildings are brand new Lotus sports cars in green, yellow, blue, silver, red or whatever colour sir or madam chooses. That initial drive through the Lotus site is one great big shiver down the spine. Lotus transcends car culture into the mainstream. Lotus is sports cars and sports cars are, to a greater or lesser extent, Lotus. Lotus Cars Limited was established in 1948 and established its first factory in north London. In 1966 Colin Chapman bought the old RAF Hethel airfield and moved production to the current site. You can explore the site on Google maps (this link takes you to the gate) and Google Street View (this link takes you to the old control tower, trackside). Lotus found themselves on a site with ready made buildings and a ready made test track, and hidden away from corporate spies. The fact it is in an isolated location with no noise restrictions means cars can pound around all day, as a classic, 90s Lotus F1 car, owned by a private customer, did for most of the time we were there. Yet more shivers down the spine. Lotus has been through its fair share of ups and downs but seems to be going through a period of stability, with Malaysian owners providing the cash for development and investment in new product and staff. We met with Lotus' ultra-friendly and professional PR, Tracey, and headed off to the factory. You enter via an innocuous side door and into a vast space comprised of old hangars and new buildings sandwiched together. Elise - in production since 1996 but refined and changed over the years. All aluminium chassis. Uses a mid-mounted 1.6 or 1.8 litre Toyota engine. Exige S - initially a track car offshoot of the Elise but now a fully fledged model in its own right with its own aluminium chassis, and steel rear subframe to house the 3.5 litre V6. Evora - introduced in 2008 and refined over the years. Again has its own aluminium chassis and front and rear steel sub-frame. Uses the 3.5 litre V6. This is Lotus' only 2+2 (the others are 2-seaters) so is slightly more practical. 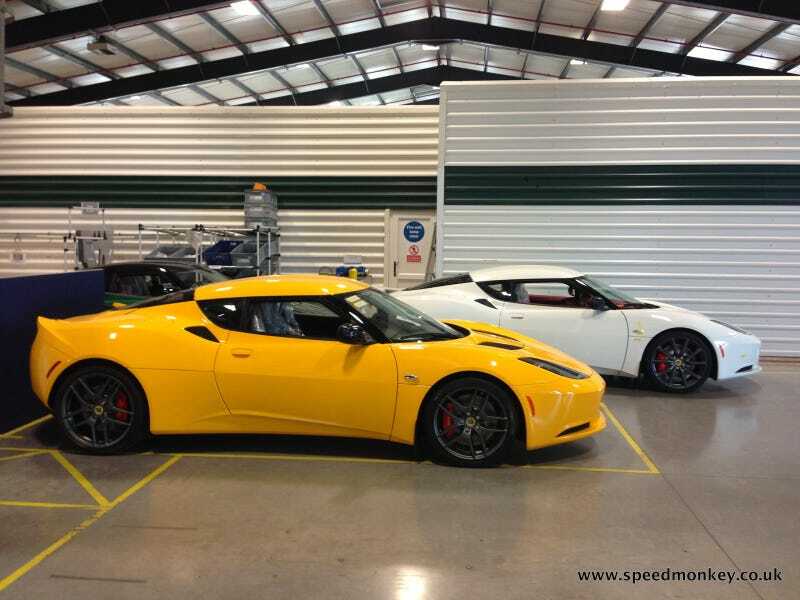 The cars start out as a basic chassis which is constructed off-site by Lotus Lightweight Structures. The chassis supplier used to be a supplier but was bought by Lotus to ensure supply remained constant. The chassis' are mounted on a jig and wheeled to the start of the production line. Because all Lotus' are hand built (there isn't a single robot in the factory) the production line is a mix of all three models (and variations of). This also means the engineers get some variety in their day to day tasks. One car might be an Exige S Roadster whilst the next might be a stripped out Elise CR. The production line is shorter than we imagined. The Rolls Royce lines at the Goodwood factory are enormous. As each car is pushed down the line on its jig more parts are bolted on to the chassis. As you move down and see each car taking shape you realise just why Lotus makes cars that handle so well. The chassis is everything. All other parts, from the suspension to the bodywork, via the fuel tank and various cables and lines, are bolted on it. When you sit in a Lotus you sit in the chassis almost like a bathtub. It's because it's so rigid that the vehicle dynamics team can then tune the suspension to suit the car, and how the driver wants it. This approach keeps Lotus ahead of the curve in terms of handling and ride. The development team are a damned skilled bunch too. Darren Cockle, Senior Engineer, Vehicle Dynamics, talked us through the Exige S we drove on track, and then showed us his driving skills (check them out on the video here). He knows everything about the car. And so he should. He's been with Lotus since 1991 and helped develop it. He was also friendly and refreshingly free from the corporate gobbledook that pervades larger companies. Everyone we met had a similar attitude. 1,100 Lotus employees make 2,000 cars a year and the family atmosphere seems to pervade the place. Anyway, back to the factory. The bare chassis is adorned with wiring, double wishbone suspension, fuel tank, roll bars, dashboard, engine and gearbox and eventually body panels and wheels. Whilst inspecting cars at varying levels of completion Tracey continually pointed out weight saving measures. That famous dictat uttered by company founder, Colin Chapman, "Simplify, then add lightness," rings true throughout. Where it is not necessary to add material then material is not added. A lot has been made of the Alfa 4C's light weight and lack of power steering. The Elise S weighs 1kg less than the 4C (Elise S - 924kg, 4C - 925kg) has no power steering, does 0-60 in 4.2 seconds compared to the 4C's 4.5 seconds and costs £10k less. The panels are painted separately so come to the car in whatever colour that particular customer has chosen. Each car is built to order. None sit in a dealers showroom waiting for someone to pick them. Once finished the car is wheeled off to inspection and quality where it sits in a bay surrounded by yellow tape. Nobody is allowed to disturb the quality inspectors as they check the car over. Then it gets tested on a rolling road and soaked, to check for leaks. The entire end to end process takes roughly 50 hours. It is then given a 10 to 20 mile run around the track and local roads. The car is then ready for delivery to a customer via one of the 15 UK dealers, or transported to a port for shipping abroad. As previously mentioned Lotus makes 2,000 cars a year. 85% are exported. You might expect the US to be the biggest market, and it isn't a small market for Lotus but they only sell the Evora in the States. Following our factory visit we took an Exige S Roadster around the track. You can read the full track test review here but in short it's an awesome car with an incredibly capable baseline that's enhanced with Lotus-tuned Bosch electronics. Lotus cars aren't cheap. You can see why when you see how they are built. Bespoke parts are bolted, riveted and glued in place. High quality components suppliers such as AP Racing and Bilstein are used. They are painted by hand, checked by hand and set-up by engineers with years of experience. The engines are bought in from Toyota but are specified and tuned by Lotus. Lotus might be in oversees ownership but it feels like a thoroughly British company, with heritage, knowledge, engineering know-how and the latest tech at its disposal. The family feel pervades the place. The staff look like they've got Lotus stamped through them. There was a sense that the Bahar affair wounded Lotus, but that the people are now happy with their cars and with their place in the automotive world. The model range may grown soon with the addition of a new Esprit, although this is more internet chatter and not something Lotus themselves would comment on. This would be the only model to survive the fall out after five new models were shown and then cancelled a few years ago. You can book a factory tour too, via this link. They might be out in the wilds of Norfolk but its a worthwhile trip.